For those on a quest to find the best Italian fine dining San Diego has to offer, you’ve come to the right place. Nestled in the lively and cultured Downtown San Diego Gaslamp District, just three blocks away from the San Diego Convention Center, BiCE presents an award-winning dining experience with a sophisticated menu that will take your senses on a delectable tour of Italy — all without leaving the twinkling skyline of Downtown San Diego. BiCE combines the comforts of true Italian hospitality, the wholesome ingredients of a real Italian marketplace, and the culinary innovation of the finest Italian chefs for a unique dining experience unlike any Downtown San Diego restaurants you’ve tried before. To begin the dining celebration, patrons enjoy some of the best signature cocktails in the Gaslamp District. Selections from an expansive international wine list and a sprawling gourmet cheese bar come together to create combinations fit for even the most ambitious connoisseur. Our full menu of intriguing and innovative Italian cuisine offers a new, enticing world of complex combinations. Complete your dining experience by choosing from an assortment of avant-garde desserts that begin with a work of art and end with a satisfied smile. 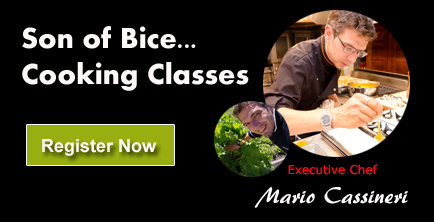 Winner of the 2011, 2012, and 2014 Gold Medallion for “Best Italian Fine Dining” by the California Restaurant Association San Diego Chapter, BiCE lives up to expectations. With genuine passion and commitment to Italian cuisine and customs, BiCE is honored to provide an upscale dining experience complete with a mouthwatering menu and hospitable staff to local San Diegans and visitors to our fine city alike. We hope to see you soon! Have a large group? Our elegant private party dining room, the Milano Room, is the perfect venue for corporate events, small parties, and other engagements, complete with a custom menu for the guests in attendance. Give us a call or request availability to learn more.